Richard Galusha's original ceiling installation is a cross and starburst of steel wrapped in gold and reflecting Steamboat's night sky. Photo courtesy Richard Galusha. The newly-expanded Holy Name Catholic Church on Oak Street is a bona fide timber and stone cathedral. While Fox Construction erected a structure that soars into the downtown Steamboat Springs skyline, the church’s genuine masterpiece is 166 handmade stained glass windows that are under construction in the basement. About a third of the stained glass has been installed. Shifting light creates a visual feast inside the church that changes throughout the day. When all windows are complete a couple years from now, their collaboration with the sun will transform the space into an astounding kaleidoscope. After close consultation with Father Ernest Bayer, local artist Gregory Effinger sketched and painted original artwork for each window to illuminate stories from the Bible, saints, the creation story and local historical moments like the parish’s first pastor arriving in Steamboat on horseback. In one window, Jesus will be shown descending over the Yampa Valley with Mount Werner, agriculture, dogs, bikers, cowboys, skiers and snowboarders featured in the scene. The meticulous job of turning drawings into stained glass has been a labor of love for Kalow and a crew of more than 35 volunteers. Kalow transforms Effinger’s drawings into workable art for stained glass. She defines the focus, selects colors of glass, and makes sure all the tiny pieces find their corresponding flow. She makes patterns to be cut up like pieces of a puzzle for the team to trace, score and break apart in glass. Each glass piece is ground smooth, edges wrapped in copper foil and reassembled within a jig. Then the windows are soldered – a meticulous art that requires precision and technique to ensure that lines are straight and that plenty of lead casing holds it all together. Years into the project now, Kalow and her core team of experienced stained glass artists have come to call Saturday “Solderday.” Soldering each window takes five or six hours. If they’re lucky, they can do two at once. “We have an 11th commandment. 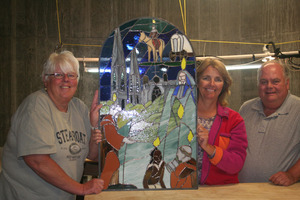 Thou shall not burn thy neighbor,” says Jerry Nanio, one of the group’s core stained glass artists. The windows are built to last forever and to expand and contract with the weather. Each one is installed inside the modern windows by Richard Reed and Kalow’s husband, Gary, with a “lift, scaffolding and a prayer,” says Kalow. Many new artists have come on board to learn the art of stained glass under Kalow’s watchful eye – a broad swath of community that is not only Catholics. “It has been really quite providential and gracious to make this happen,” Father Bayer says. The stained glass is a wholly volunteer effort. Kalow estimates that each of the Last Supper windows, a series which is already installed at the front of the church, took 80+ hours. 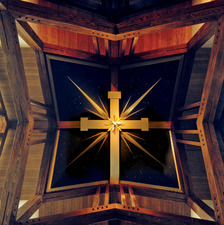 A circle of stained glass windows representing the mysteries of light is already installed at the peak of the church. They surround local artist Richard Galusha’s original ceiling installation, a starburst of steel wrapped in gold that reflects a night sky with the eight constellations seen over Steamboat in December – a beautifully- wrought and locally inspired threshold between heaven and earth.